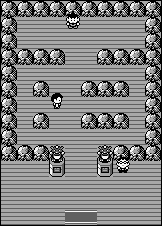 In Pewter City you will fight Brock, your first Pokémon Gym Leader. The Pokémon he uses in battle are strong, but they have some major weaknesses to be exploited. If necessary, build up the experience of your own Pokémon by having battles in the wild. 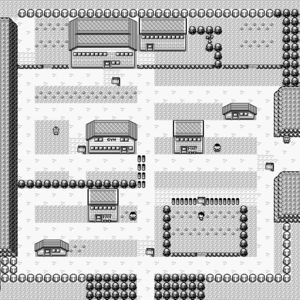 Before you do either, visit the Pokémon Center in Pewter City, so if your Pokémon faint in battle, you'll resume your journey there instead of far away. If you try to leave town to the east, you'll be taken to battle the town's Gym Leader, Brock, at his Gym in the middle of town. Until you've beat him, this town is as far as you can travel. It'll cost you 50 to get into the museum (the large building in the north part of town), and while there's lots of interesting exhibits, nothing here will help you directly. The good stuff is in the back, but that way is blocked by one of those annoying plants... You'll have to come back later. Here's an interesting piece of trivia for Yellow version players: what the father upstairs says changes based on your Pikachu's mood. If your Pikachu is clearly upset (if you've left it in the computer too long, for example), he'll ask you to give it to his daughter! Of course, the game won't actually let you. Once you have a Pokémon that has learned the HM move Cut, you can later come back, sneak in to the back of the museum where a tree blocks its entrance and acquire an Old Amber from a scientist. You can later revive the Old Amber for an Aerodactyl in Cinnibar Island. Brock's Junior Trainer, strangely enough, uses Ground-type Pokémon, while Brock himself uses Rock/Ground dual-types. Neither has any Ground or Rock-type attacks to use, so Pokémon weak to those types can still be used. Resistances should still be considered, however. Remember to save your game before you battle Brock. If you're playing Red or Blue, and you picked Bulbasaur or Squirtle, you should have an easy time of it, since both of these Pokémon can learn attacks that will eliminate these Pokémon in a couple turns (As long as Bulbasaur is Level 13.) But if you picked Charmander, or have a Bulbasaur without Vine Whip, then you'll have to fight a longer battle (Hint: use Leech Seed, then Growl six times). That wouldn't be a problem, but Brock's Onix has Bide. Bide absorbs the damage Onix takes over two turns (Onix still takes the damage), and then deals it back at double damage. This is usually enough to seriously weaken your Pokémon, if not knock it out right away. You have a few options you can use to get by this. The first is to just use your Charmander or Bulbasaur anyway. Charmander can use Ember, which will still deal decent damage due to the low Special of Brock's Pokémon. When Onix uses Bide, Charmander should then switch to Growl until Bide ends. Bulbasaur can use a similar tactic with Tackle and Growl, and plant a Leech Seed to do even more, since indirect damage will not trigger Bide. Another option is training a Caterpie or Metapod to at least level 12 (level 10 in Yellow). This will give it Confusion, a Psychic-type attack which can take away large chunks of HP from Brock's Pokémon. This can be hard to do in Pokémon Red, as Caterpie and Metapod are much harder to obtain in it than in Blue. Pokémon Yellow presents an even bigger challenge. Pikachu is useless against Rock/Ground-types, with its Electric and Normal attacks doing extremely little or even not doing damage his Pokémon at all (Electric attacks have no effect on Ground-types). But Pokémon Yellow also provides Fighting attacks, which can easily defeat Rock-type Pokémon. The best that you can do to him is a Level 9 Mankey that knows the Fighting-type attack Low Kick, while level 12 Nidoran of either gender can use Double Kick (which they can't learn until level 43 in Red or Blue). Either of these will allow you to take down Brock's Pokémon in a few hits, and both can easily be captured west of Viridian City. Once you defeat Brock, he'll give you TM 34 (Bide) and the Boulder Badge, which grants your Pokémon a small Attack boost (12.5%, in-game battles only) and allows you to use Flash (once you have HM05). This page was last edited on 31 December 2015, at 01:17. This page has been accessed 804,393 times.